We awoke this morning on our futons at Shirasagiyu Tawaraya Ryokan near Kaga-Onsen. Last night during dinner we had been asked what time we would like to have breakfast and were given a choice between Japanese or Western Style. As we wanted to get going early we chose the earliest time, 07:30 I think, and the Japanese Style breakfast. Before breakfast though we took the opportunity to use the onsen. The male/female sides had switched overnight and I was able to confirm that the ladies side (at night) is superior to the male side. Unfortunately, while waiting for breakfast we made a bit of a faux pas in that we didn't leave our door open when we were ready- apparently that's what you're supposed it do. We just waited and waited, and started getting anxious as the nominated time came and went. It took a phone call from the lady who was looking after us before we realised we had to open up. Whoops! While our host was serving breakfast we were asked what our plans were for the day. We relayed that we were planning to visit the Eiheiji Temple and then the Dinosaur Museum in nearby Fukui Prefecture. Once we had finished eating we waited a little bit to see if there was anything further but soon decided we'd best be on our way. After a fifty minute drive though Ishikawa and then Fukui Prefecture we finally arrived at Eiheiji Temple. The roads were pretty normal most of the way, however when we reached the town in front of the temple the streets suddenly narrowed and the surroundings exploded into retrofitted paid parking bazaars. Each shop or residence in the area had a couple of spaces for sale, all at varying prices. We managed to find a reasonably close and cheap spot (300 yen for the day) as it was still pretty early with few other cars or people around. The actual temple was quite a bit more intense than we were expecting, and a lot stricter than any other we had visited in Japan. Apparently we were taken in as monks in training and some of the rules included making sure to follow the left wall when walking around, no loud noises, and strictly no photos of the monks or any interior areas. Eiheiji was quite interesting and we learnt about some aspects of the monk's daily lives, such as only washing on dates ending in a 4 or 9, head shaving and the fact that they have to spend a lot of time pretty much living on a single small mat. Also we saw quite a few monks doing seemingly pointless tasks (e.g. endlessly smoothing ash into a cone shape), which were perhaps meant to teach some sort of religious lesson. The temple was very big, and although we spent quite a while walking around inside we only really saw a small section of it. In the centre (of the section we viewed) there was a nice garden with some water- the only place we could take photos. Nearby we saw a wooden board that held Emperor Meiji's signature! Also, while we were there a funeral/memorial service was being conducted for a lady, and a monk was chanting very intensely. I was quite surprised when it suddenly ended and the monk said a very businesslike "that concludes the service" and started small talk to the lady about her plans for the rest of the day and such. After we exited the temple we had a bit of a look at the end of the road, but didn't find much there apart from the start of a path to the top of a hill. So, next up, the Fukui Dinosaur Museum! This next drive wasn't too far, and as we approached we could actually see it in the distance- a big silver dome! The museum seems to be located in a pretty weird spot in the middle of rice fields in the remote countryside of Fukui. However, it's actually located right next to where a rare instance of Japanese Dinosaur fossils were discovered. The museum cost 720 yen for the permanent exhibition but we paid 1,200 yen so we could also have a look at the special exhibition which was on Spanish dinosaurs. This special section probably wasn't worth it as it was all in Japanese had flanderized Spanish cartoons and comparatively few specimens. The start of the main section began with a long escalator ride down to the bottom of the building- from there we then basically circled around back up to the top. Unlike the special exhibit, the normal ones had a reasonable number of English explanations. Apart from just dinosaur exhibits there were also sections explaining evolution as well as geology. My major at university was geological science so I spent a little too long in this section to the exasperation of Kate. I particularly like a display that had lots of different rocks that rotated around, and I had fun trying to guess the name of the rocks. Along with many recreated dinosaur skeletons there were also a few more in situ examples as well as a few animatronic creations. The robotic T-Rex was pretty realistic and cool! The less fleshy exhibits were a mix of the actual fossils and replicas. Once Kate had finally dragged me away from the exhibits we stopped in at the museum's cafe for some chips and chicken for myself and a dinosaur parfait for Kate. After finishing our food we next headed back to the car and drove back up to Kaga Onsen to visit Natadera Temple. Like the shrine we went to yesterday, Natadera was also built due to religious associations with the nearby Mount Hakusan. The location was a bit out of the way, and there wasn't too much around apart from a large amount of love hotels. This temple was a bit loud as there was currently some construction going on, but it did have some nice gardens, lots of grounds to explore, a big water reservoir out the back, and you could even climb up the sides of some cliffs to visit some caves. There was a large number of signs in front of the path up with a lot of information about lack of liability and to proceed at your own risk- it almost looked like it was closed. The climb up was quite steep- but fun! There were two routes you could follow to circle the grounds but due to time constrains we took the quicker trip that still took us up to a great viewing platform. After the temple we decided to sneak in one last sight- the oldest business and hotel in the world. Or so we thought at the time! Hoshi Ryokan was founded in 705BCE and has continued operating by the same family for the last 2297 years, passing through a total of forty-six (46!) generations! Unfortunately for Hoshi, Nishiyama Onsen Keiunkan was founded just 13 years earlier and therefore holds the world's oldest claim and current Guinness record. After peaking at the hotel, which was quite difficult for us to find (our pocket Wi-Fi had recently died), we headed back to our hotel for dinner in our room at Shirasagiyu Tawaraya Ryokan. 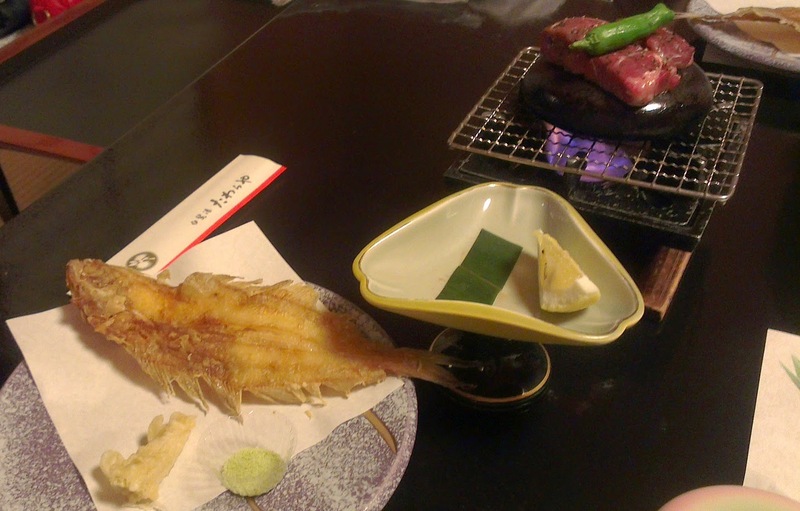 One of the foods we had was a grilled fish on a stick that we'd seen a few times before and had wondered about and struggled it eat. The main problem with it is that it has still got lots of little bones in it! I asked about this and was told that the bones were good for your body, and that we were just supposed to crunch them up with our teeth! We did our best, but still got told off a little bit (in a friendly way) for leaving a lot of the fish. It's hard when we've been trained for so long to be cautious of fish bones. We also found out at dinner that our host had gone to get a dino museum brochure for us, but we had already left when we got back. For tomorrow our friendly host gave us some other brochures instead. While there was an interesting theme park on one of them, we'd planned to leave Kaga early tomorrow in order to participate in a cooking class and view the Gion Matsuri in Kyoto! Hopefully you get a chance to go again! No matter how long I go for I always wish it was longer!